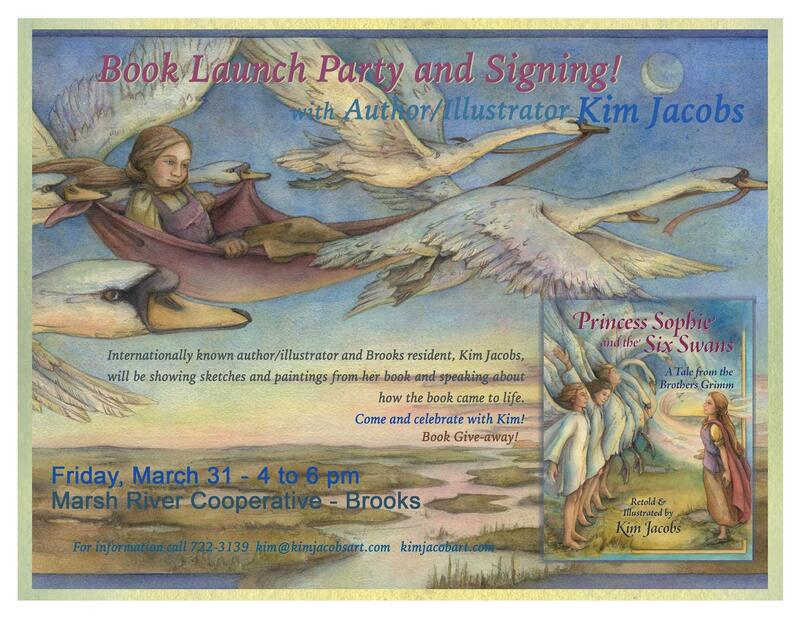 Kim hopes you will come and help her celebrate the release of Princess Sophie and the Six Swans, A Tale from the Brothers Grimm. Her new book, for “children” of all ages, has been years in the making – a long journey with a few twists and turns – and is the fulfillment of a long held dream. She will be showing sketches and paintings from the book and speaking about her journey and how the book came to life. Kim is an internationally known illustrator living in Brooks, whose work has appeared on a wide range of gift and stationery products, toys, puzzles, books and calendars – selling in the millions throughout the world and, of course, at the Marsh River Coop! Book Give-way and goodies to eat! Previous Previous post: New Awesome Flyer for Tonight’s Quiz Night. Come one come all!